What to serve as "starter" for some amazing and fantastic girl friends ?? A glass of "bobbles" is always a good starting point ! However, I decided to google the word "champagne cocktail, and doing this I located this site called: The Fifty Best Champagne Cocktail. 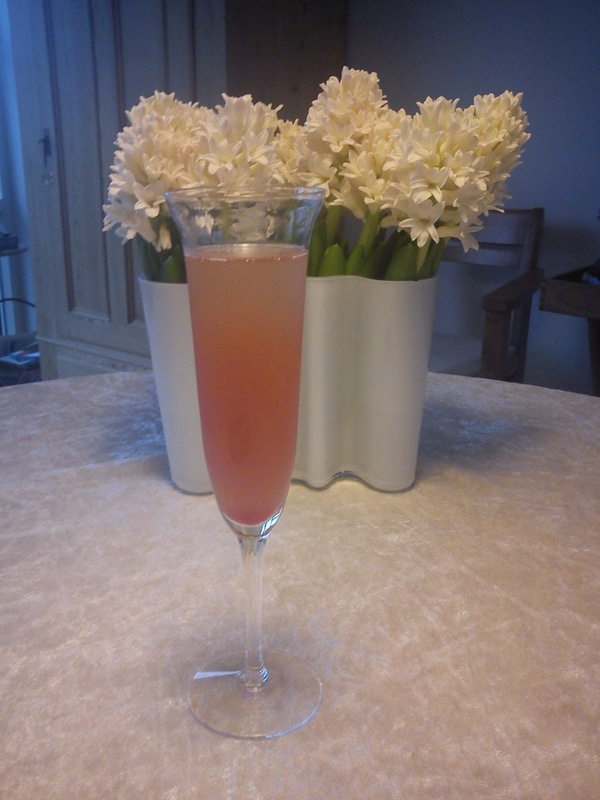 Reading through these recipes I found a champagne cocktail called "Pretty Woman", and this was just the answer to my search. 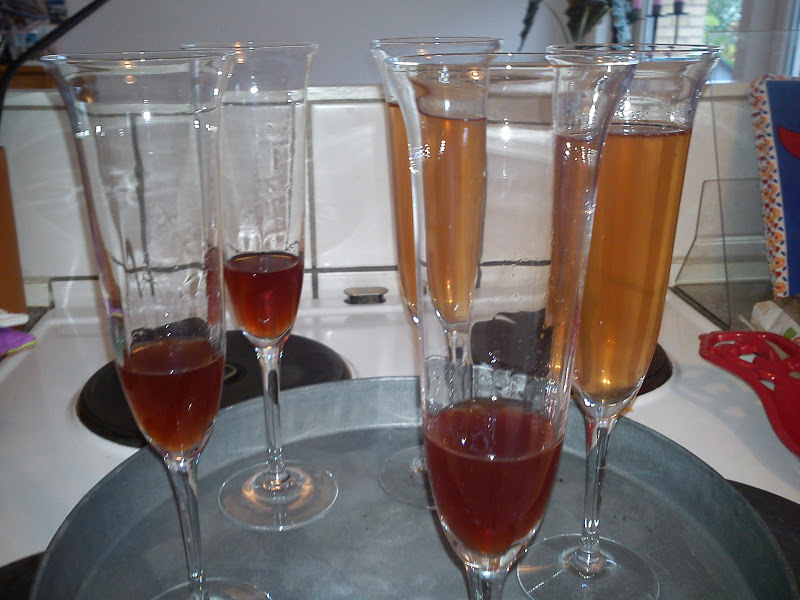 If I should not serve "Pretty Woman" for my great girl friends, to whom should I serve this champagne cocktail ? 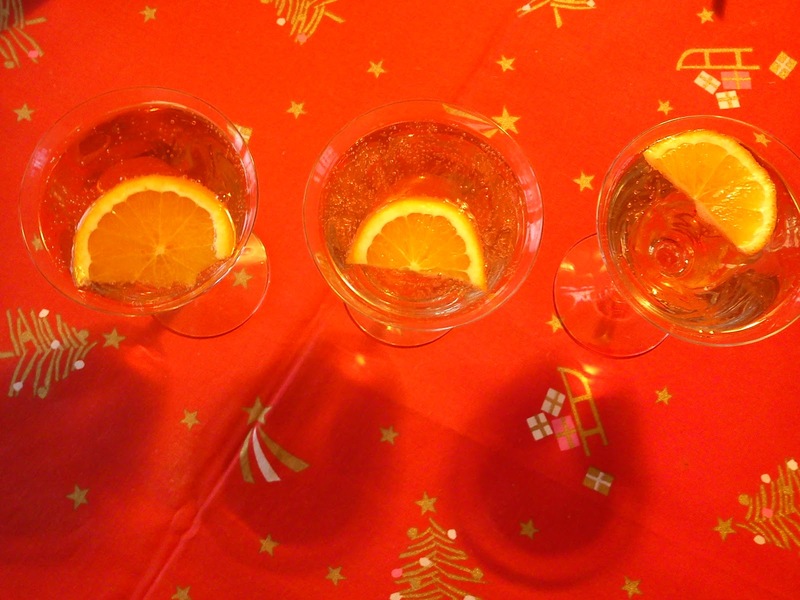 Fill a Martini glass with Grand Marnier and cranberry juice. Add a slice of orange. What is this "funny" thing ? 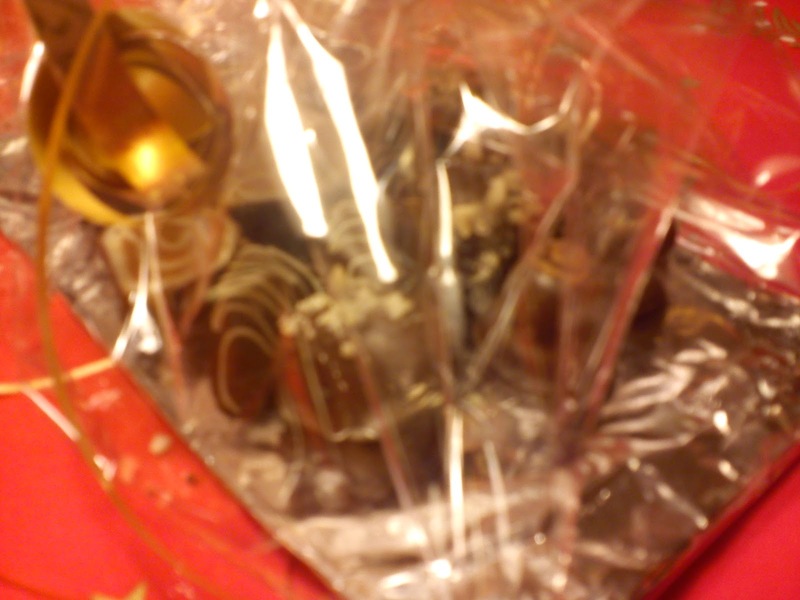 Well first of all it is a Christmas gift from my mother. And secondly it is baking form from Alsace in France, which is used for baking lamb shaped cakes for Easter. 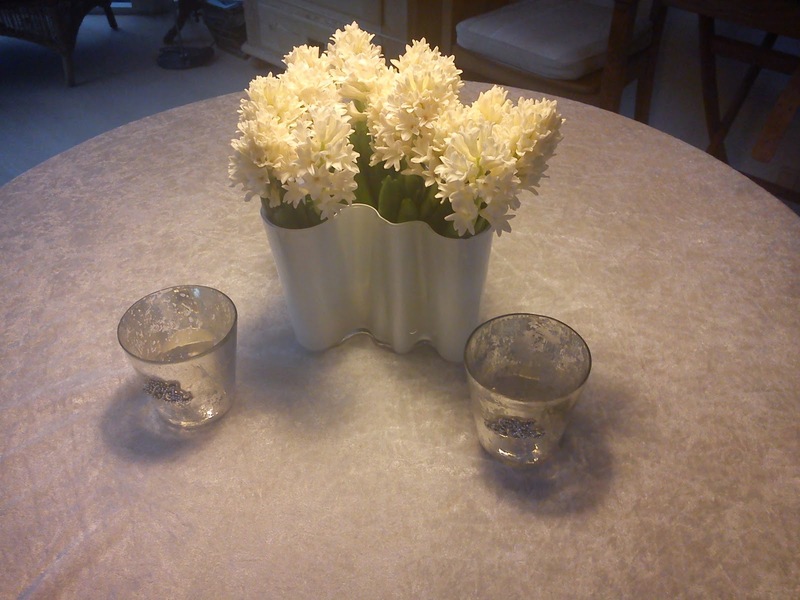 So it is actually a perfect Christmas gift, as we have a saying in Denmark, that Christmas is lasting until Easter !!!! 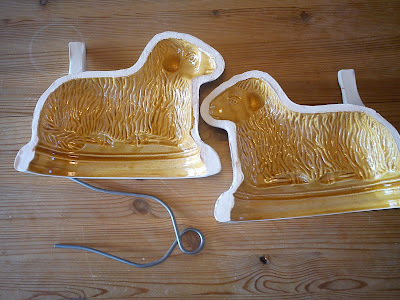 So I will be baking lamb cake for Easter in 2013. 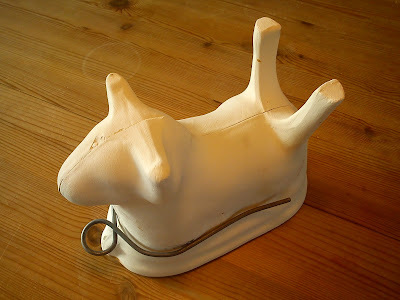 However, before I can bake such a lamb cake, I need to find a recipe on such a French/Alsace style lamb cake !!!!! 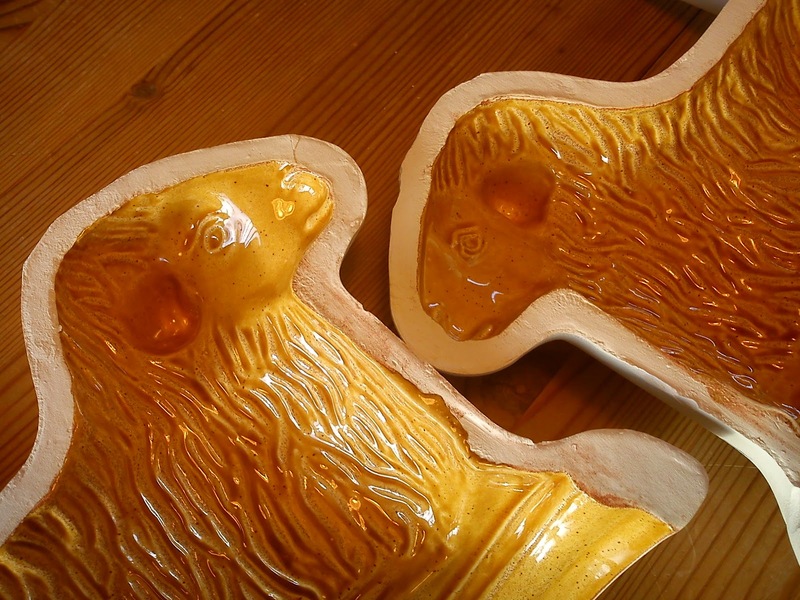 If you should know such a lamb cake recipe, please feel free to share it with me. Christmas lunch 2012 with "The Fantastic Women"
The yearly Christmas lunch for "The Fantastic Women" took place this afternoon. 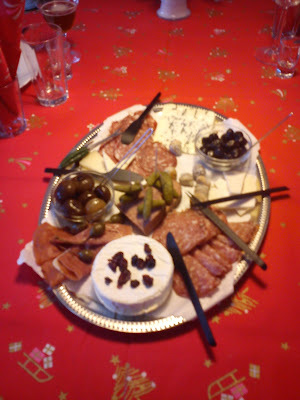 As the menu as usual was the "traditional" cheese tapas from Osteriet Vejle, which is a very nice alternative to the traditional Danish Christmas lunch combined with being very, very easy to serve, as you only have to remove the cling film for the serving dish in order to serve the lunch. As a great start to this yearly Christmas lunch I decided to start off with a champagne cocktail called "Pretty Woman" as an excellent tribute to my amazing girl friends. Afterwards we spend a wonderful afternoon in each other company eating, drinking. laughing, talking, talking and yet some more talking. My fantastic girl friends brought me some very nice hostess gifts in form of chocolate, a new Tupperware "plastic thing" from my cousin, pear jam and some great home-made Christmas candy/confect. As usual all these amazing girl friends are invited again for Christmas lunch next year in 2013 :-) As final comment to our fifth great friend from Odense; you have no excuse for not turning up in 2013, this year you are excused due to your around the world trip, but you can NOT use this excuse next time !!!! Celebration of New Year moving from the old year of 2012 to a brand new year of 2013 requires some champagne/sparkling wine/bobbles and in Denmark also cakes made of marzipan as well. So a prepration for the fast approaching 2013 I have collected all the various suggestions on marzipan cake (known as kransekage in Denmark), which I have created during the "life time" of Kitchen of Kiki in this blog post and a few suggestions for sparkling drinks. The major advantages of making your own marzipan cake is, that you are in control of the overall sweetness in the final cake, so you can make the cake more or less sweet according to your sweetness preference, instead for "just living with" the sweetness in the cakes, which you buy. Final important remark: remember to serve the marzipan cake with a sweet type of champagne or sparkling wine, as the combination of sweet marzipan cake and dry sparkling wine is a taste killer. 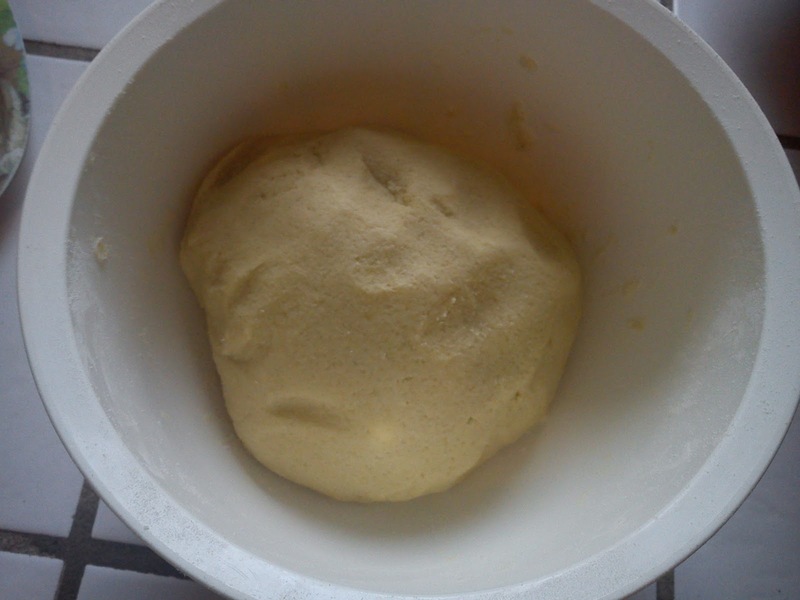 If you would like to have more softness in your marzipan cake, you should freeze them after baking. The only drawback is, that freezing reduce the overall flavour profile of the cake. 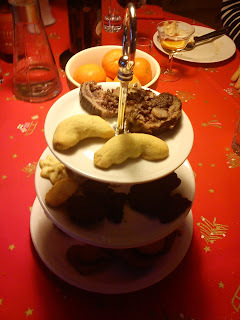 As a colourfull farwell to 2012 these baked marzipan confect are an option. 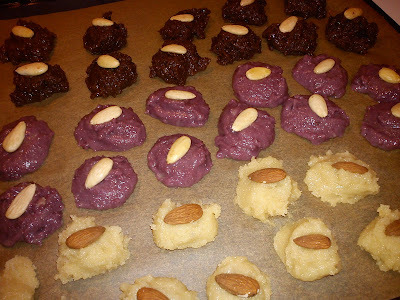 The only drawback is, that the forefruit marzipan (purple looking marzipan) is loosing colour durin the baking !!! Well, now the cake "situation" is sorted !!! However, instead of drinking the "usual" glass of champagne/sparkling wine, I have found the following cocktail suggestions based on sparkling wine. Another elegante twist is Amarena cherry sparkling drink. A finally colour suggestion is my very own version of Kir Royal in form of Lønnestræde Kir Royal. I do not know about you, but I have been having a lot of fun making my very own Christmas Calendar in my kitchen here in 2012, just like the ones on TV ! Some of my good work colleagues and friends have been feeling a big pressure since October, as I have been nagging them for their family recipes for this Christmas Calendar. Looking into the review of Christmas Calendar 2011 I can , that I have kept my promise to you about NOT to fill your kitchen cupboards with confect, instead of I have filling them up with cookies and cakes using colleagues and friends favourite recipes as well as interesting recipe located in magazines and blogs from around the world: Australia - Denmark - Estonia - Finland - France, Germany, Italy and Sweden. 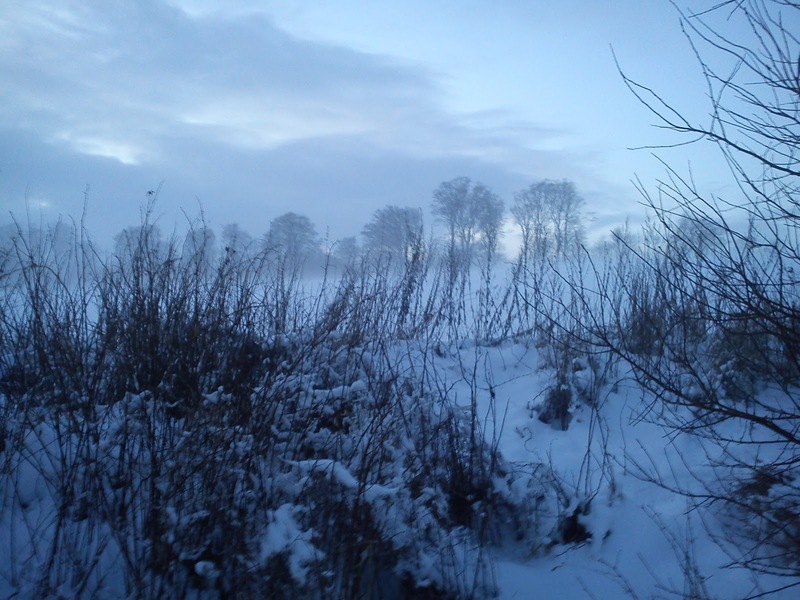 However, just as interesting is, that the following post from Christmas Calendar 2011 have turned out to be quiet popular as well here in 2012, perhaps you could call them classic or evergreens ? So based on these most popular post I will make the conclusion, that you still are a great fan of Christmas confect containing plenty of marzipan, butter cookies from Germany and France incl French style Madeleines and alcohol !!! I assume this profile is fitting 120% of most of us Danes. 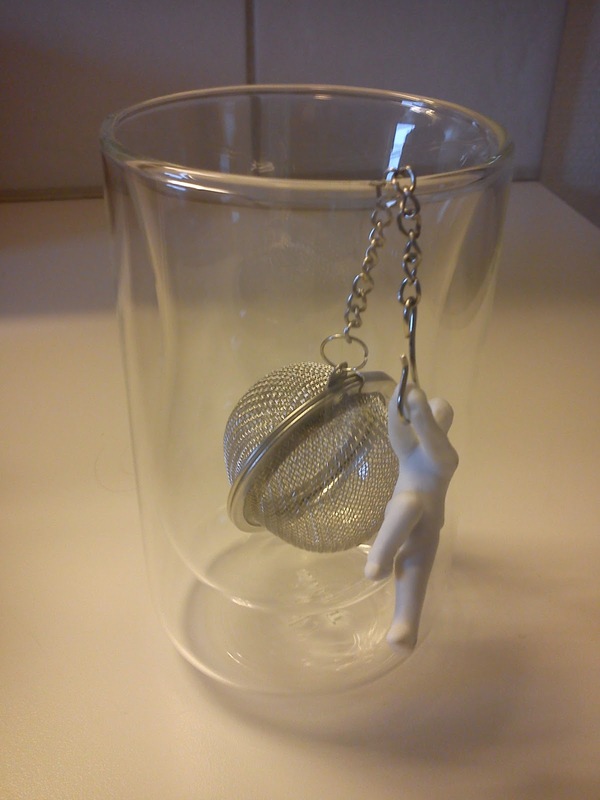 I can already now promise you, that I will be making a Christmas Calendar in 2013. However, right here and now I have no clue/idea, if the 2013 version should have a theme. If you have an idea, please feel to leave a comment. You are also more than welcome to share your opinion on Christmas Calender 2012 at the same time. 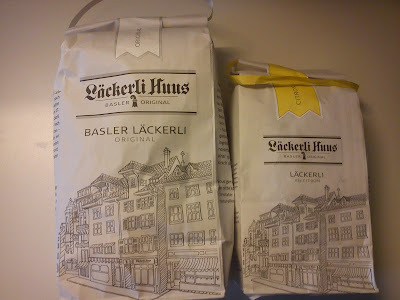 I have a sweet tooth, and these cookies from Läckerli Huus in Switzerland, have become a favourite of mine. So I was stocking up on these cake during my latest week-end in Switzerland. I wish you a merry Christmas during your visit in my little kitchen. I hope you will enjoy your stay here, being either a short browse or a long stay. Today is the last blog post in the Christmas Calendar 2012, which I have spend many enjoyable hours in my kitchen to make. 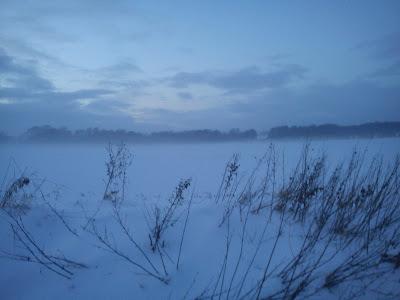 I hope you have enjoy spending your time on reading the various blogging post during this month of December as well. If the weather will not give us a white Christmas, at least I can share a lovely Winter picture with you instead of. Today´s recipe is the last recipe in this year Christmas Calendar 2012, and we are so close to Christmas, I decided to keep it simple !! 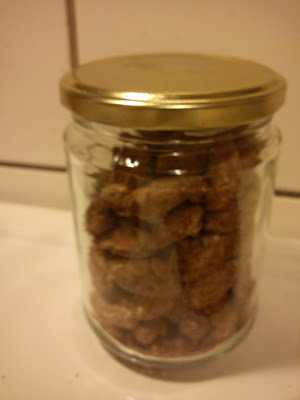 I have been giving a Danish twist to these sugar and spice almonds by exchanging the cinnamon with liquorice powder, as we Danes need "tons" of liquorice in order to keep up our blood pressure during the dark, rainy and grey Danish Winter. Preheat the (conventional) oven to 180'C. 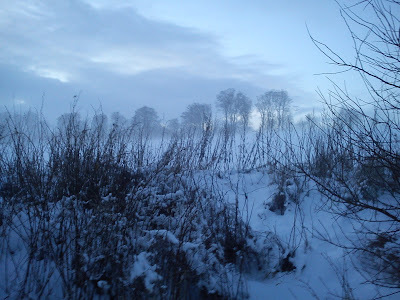 Mix icing sugar and liquorice powder together. Sift this sugar mix together twice. 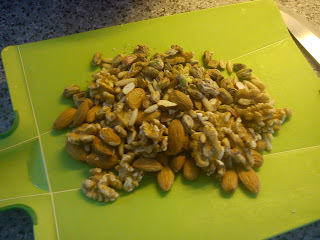 Rinse the almonds in cold water, shake them well. Cover a baking dish with baking paper. Place the wet almonds in the dish. 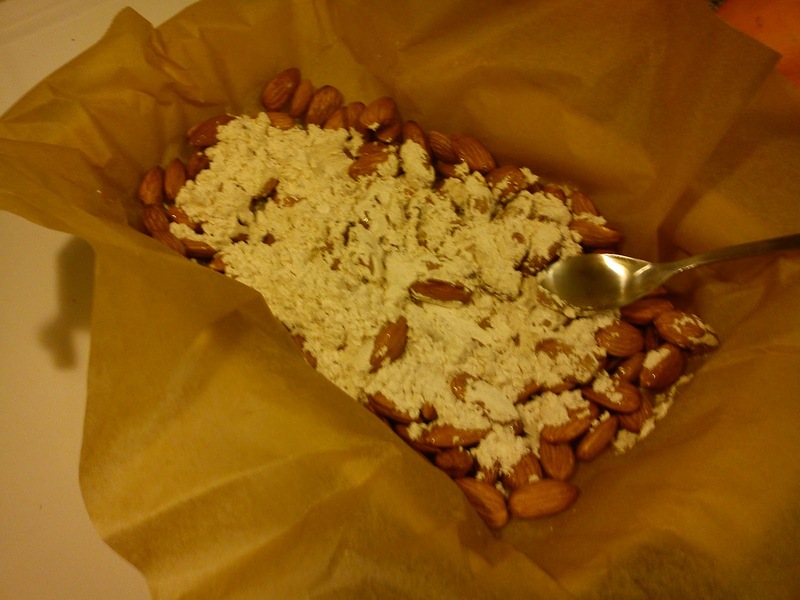 Add the icing sugar over the almonds, mix the almonds and sugar very well together. Roast the almonds in the oven at 180'C for 20 minutes, stirring halfway through the roasting time. Cool down the almonds, separate them from each other and place them in an airtight container. Christstollen (German Christmas cake) has also always been a part of the sweet things served during Christmas time since I was a small child. 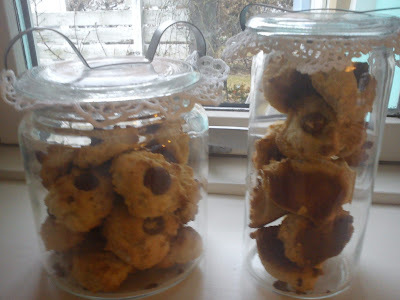 However, it was first year, that I baked my very first own version of a Stollen using a German colleague family recipe. 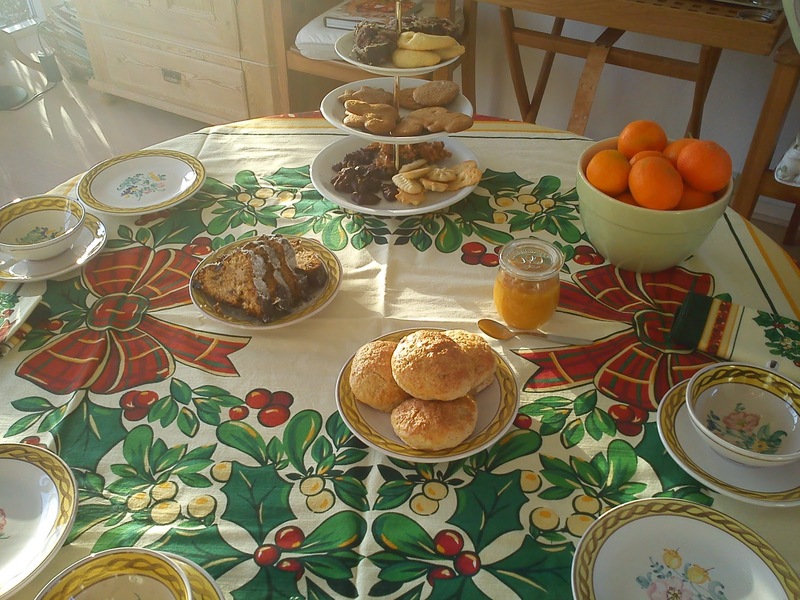 And this Autumn I actually brought my own stollen form in Germany, which included 2 different recipes on Stollen. I have been struggling a bit with the first recipe, as the translation from German to English did NOT include a translation of the baking temperature for both conventional oven and fan oven, so in my first trial I ended up baking the Christstollen at too high temperature !!!! Dissolve the yeast together with a teaspoon of the sugar in the milk. Add in the flour. 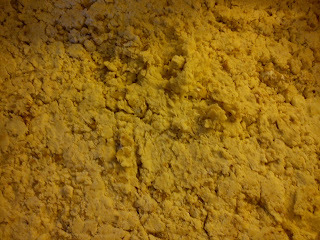 The dough is having crumble structure. Raise the dough for 45 minutes. 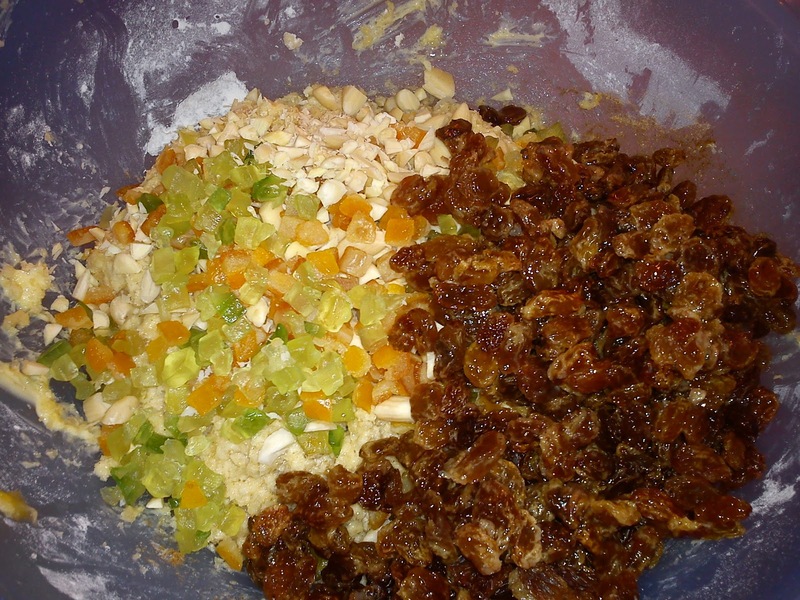 Meanwhile mix the rum and sultanas together and let it rest until needed. Add soft butter, egg, sugar, grated marzipan, and salt to the dough mixture. Knead it together. Raise the dough again for another 45 minutes. Heat the (conventional) oven to 180'C !!!! 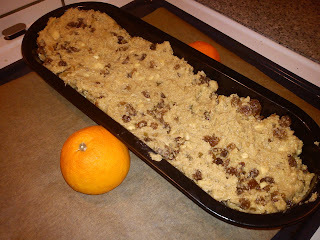 Add the chopped almonds, sultanas in rum, sucat and candied orange peel to the dough. Knead everything together. 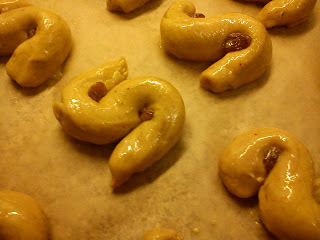 Grease the stollen form with butter or oil. Fill in the stollen form with stollen dough. Cover a baking sheet with baking paper. Turn the stollen form up side down, so the stollen dough is covered by the stollen form, when it is baked in the oven. 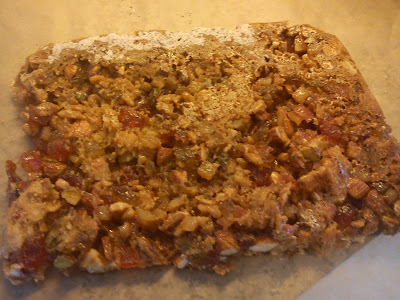 After 55 minutes baking remove the stollen form. Bake the stollen for another 20 minutes. After a total baking time of 75 minutes, remove the stollen from the oven. Brush the warm Christstollen with melted butter. After the Christstollen is cooled down or before serving it sprinkled it with icing sugar. Another type of German Christmas cakes, which I have a serious soft spot for is Lebkuchen. 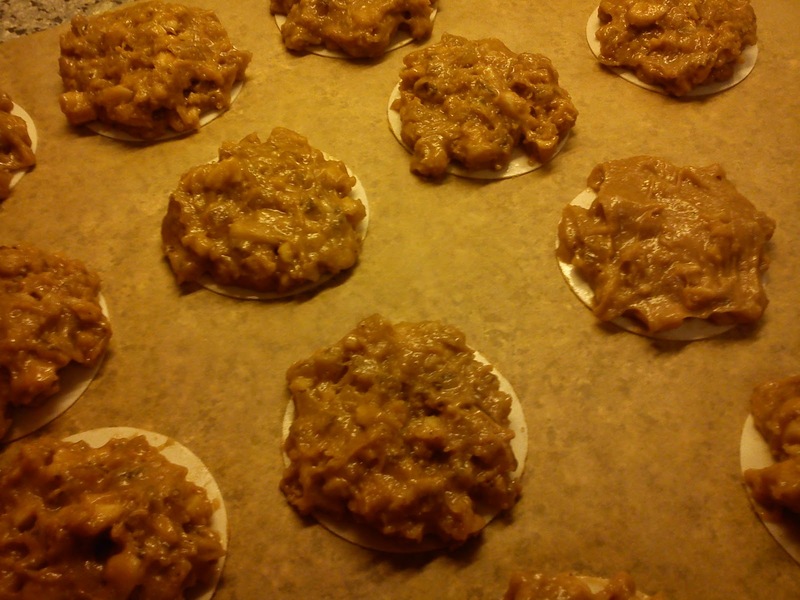 And last Christmas I found this recipe on lebkuchen, which were a BIG DISAPPOINTMENT !!!! 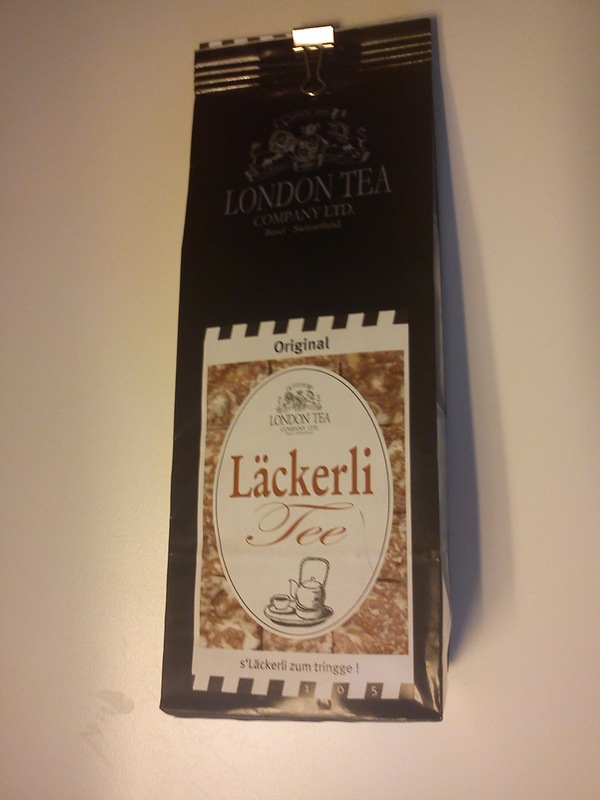 They did not even look like the lebkuchen, which you can buy in Germany. However, when my colleagues were eating their way through these DISAPPOINTING lebkuchens, a colleagues told me, that she understood my disappointment, because she had tasted brilliant tasting home-made lebkuchen in Germany. And this colleague of mine offered to track down this recipe on home-mad lebkuchen next time, she was in Germany. And in the beginning of December this year I got THE recipe, which is very long and contains many different spices. But these lebkuchen are excellent, they are like eatable gold and they are full of sucat, which you like or dislike !!!! 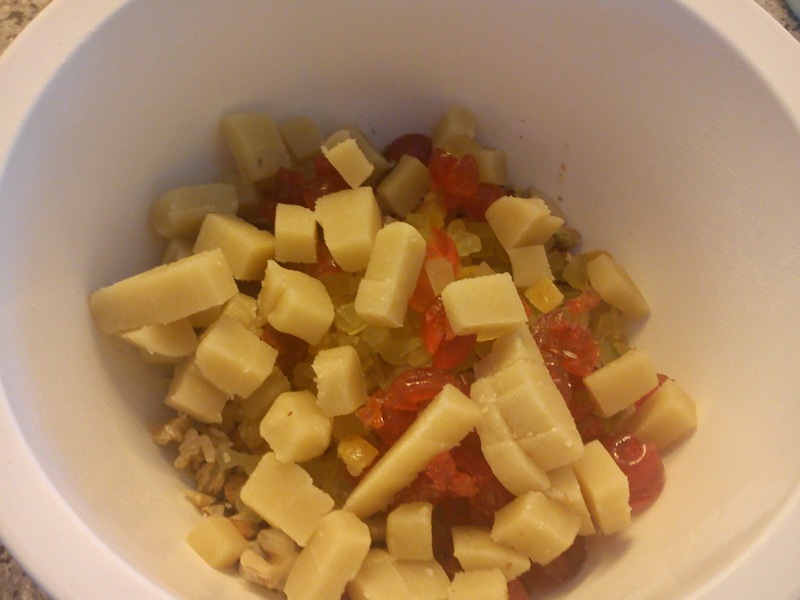 Mix everything together in a mixing bowl. 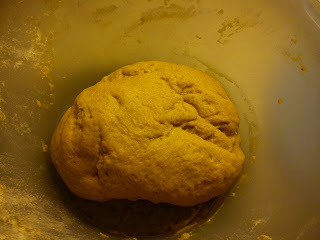 Let the dough rest for minimum 8 hours. Spread the dough on top of the oblates. Place the oblates on baking sheet covered with baking paper with a good distance between each oblate. Bake in the middle of the oven at 200'C for 15 minutes. Among the various recipes, which I received from my good Australian colleague, was this recipe on Raspberry Walnut Slice, which I decided to make as well in order to bring some fruit, light flavour into my little kitchen. It is a cake, which is not heavy in any way, which many Christmas cakes can be in both taste and calories. Well I have no idea about the calorie content in this one, I mean it does contain BUTTER. 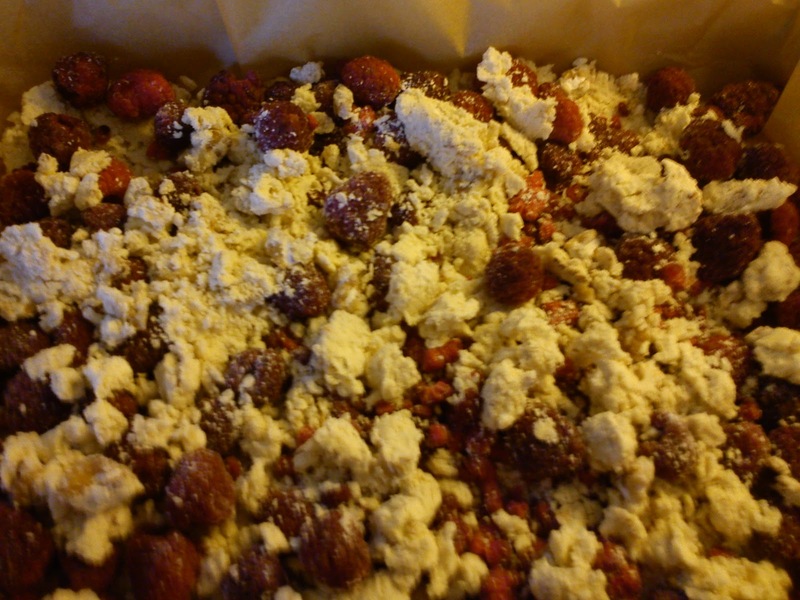 Cover a baking tray of 20 x 30 cm in baking paper. Whip the soft butter and sifted icing sugar together until light and fluffy. 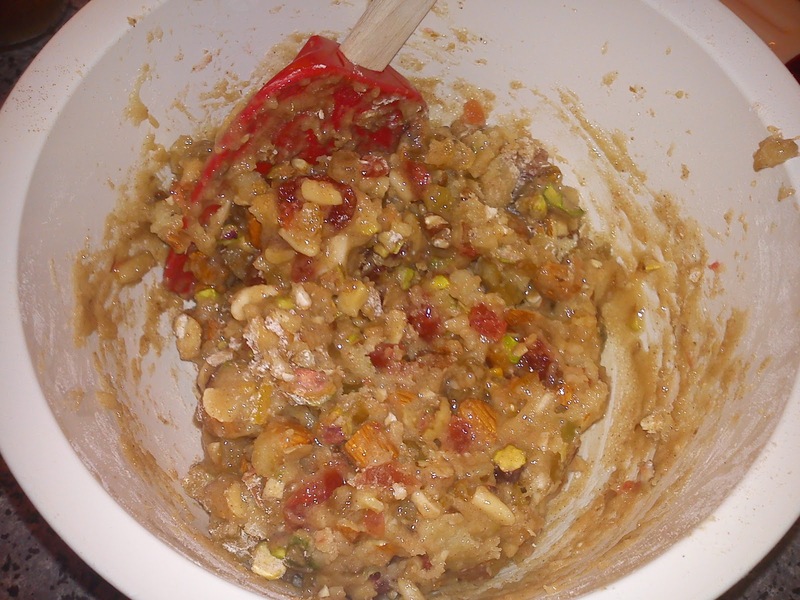 Stir in the cinnamon, followed by sifted flour and chopped nuts. 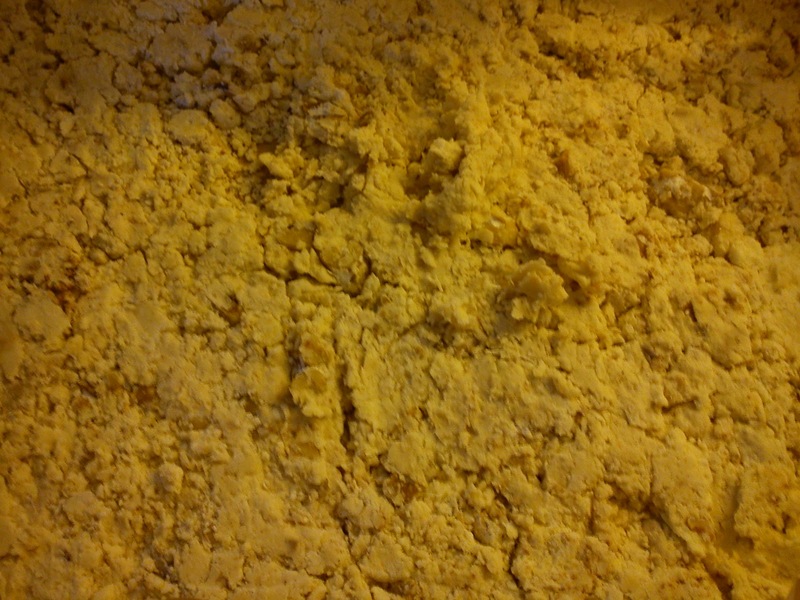 The dough looks crumbly. Place 2½ dl of the cake mix aside for later use. Press the rest of the cake into the baking tray. 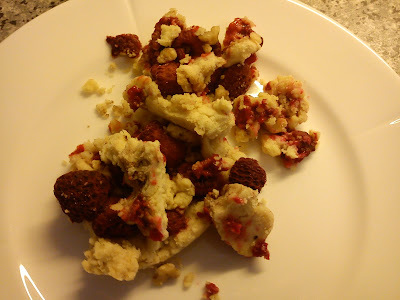 Place the raspberries on top. 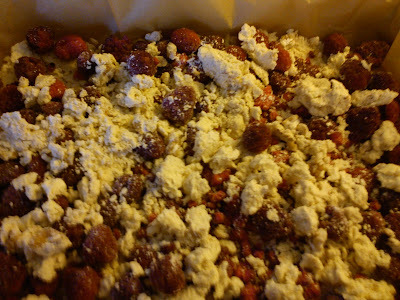 Sprinkle with left-over cake crumble. Bake in the middle of the oven at 180'C for 40 minutes. Cool down the cake, before cutting into slices. 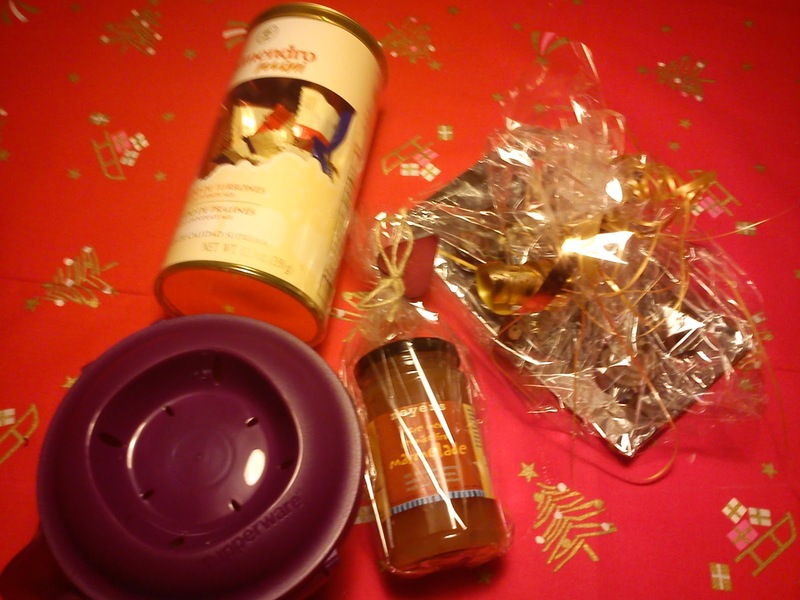 A good colleague of mine from Australia arrived some time ago for a meeting for at work with a "goodie bag" for me with various Women´s Weekly recipe books on baking and Christmas treats and a box of tea in order to fulfil my request for recipes for this year´s Christmas Calendar. 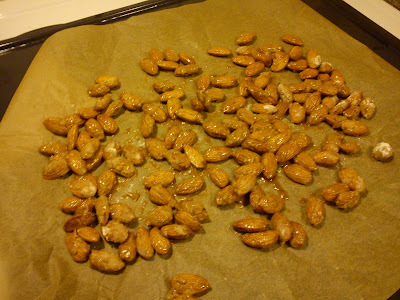 Among all these lovely recipes I found this one on roasted cinnamon almonds. This recipe is more time consuming compared to my "usual" "burnt" cinnamon almonds, which also can be twisted into this combination of burnt roasted almonds. In my opinion you could consider to increase the amount of cinnamon from ½ teaspoon to 1 teaspoon, if you want a bigger taste of Christmas in your almonds. Mix icing sugar and cinnamon together. Sift this sugar mix together twice. The epitome of Danish Christmas comfort food is gløgg & æbleskiver = mulled red wine and apple slices, which you will be served almost everywhere you are invited during December in Denmark. I would estimate, that 99 times out of 100 the apple slices are ready-to-use in form of frozen pre-made apple slices from a factory. And you can hear various people discussing, which pre-made apple slices are the best among all the many pre-made frozen apple slices. However, the best apple slices are the apple slices, which you made and bake yourselves. 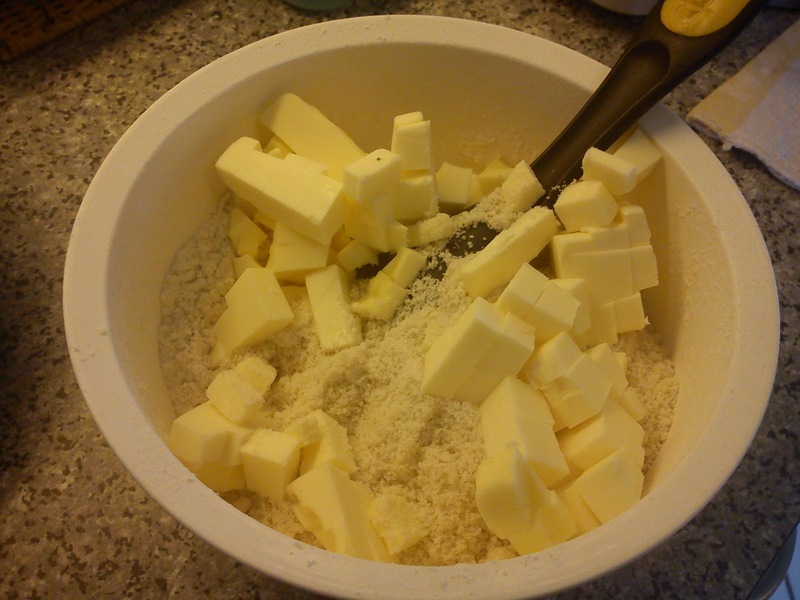 But is a time consuming task, and the baking process requires plenty of BUTTER !!!!! for the æbleskive pande (=apple slices frying pan). 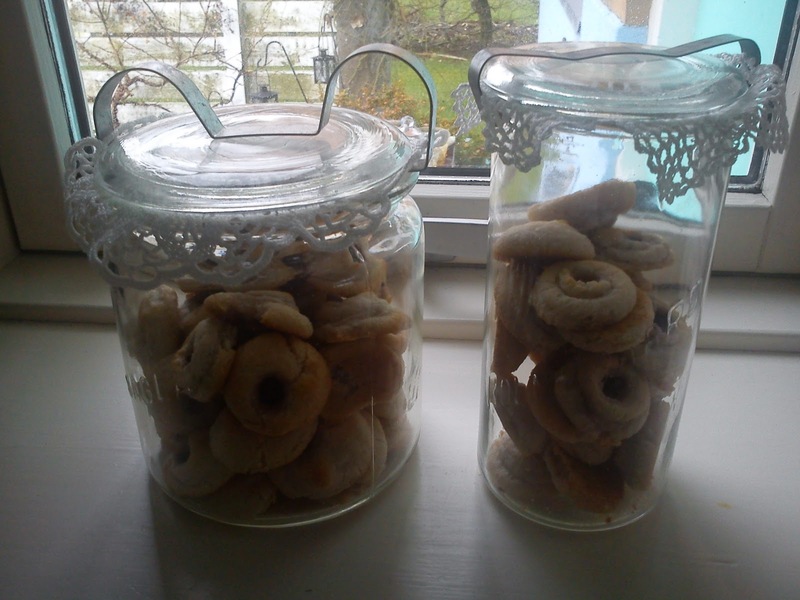 I have found this recipe on apple slices with apple compote & marzipan in the weekly magazine called "Alt for damerne", issue 44/2012. I did not make any modification to this recipe. Cook the apple pieces with water and sugar in a cooking pot into apple mash. Mash the apple, when they are soft. 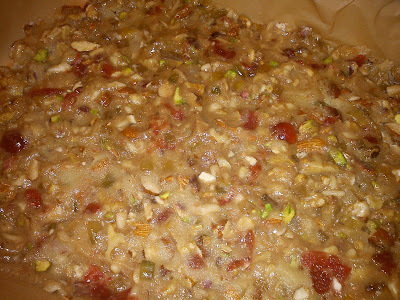 Mix the apple mash with marzipan. Remove the vanilla corns from the vanilla pod. Robe the vanilla corns together with the sugar. Put into a mixing bowl. Add flour, salt, cardamon, baking soda and lemon zest into the mixing bowl. Whip the egg yolk, buttermilk and whole fat milk together, add into the mixing bowl. Let the dough rest for ½ hour. Whip the egg white stiff. Gently mix the dough and egg white together. Heat up the apple slices pan, fill a small lump of butter into each hole. 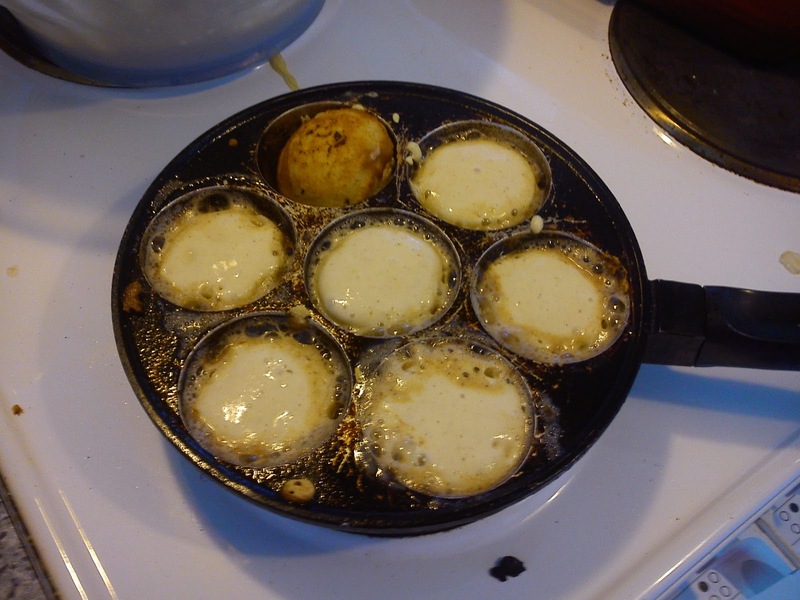 When the butter is frying, fill each hole ½ up with dough. 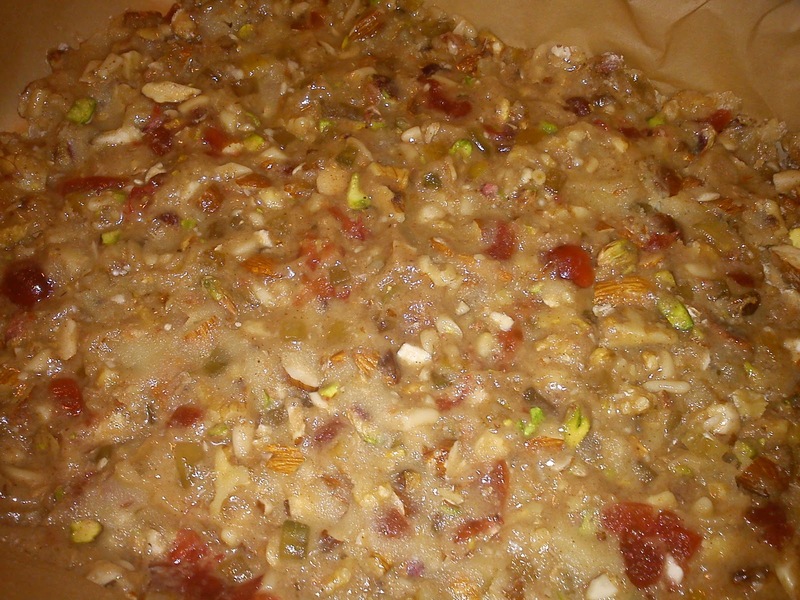 When the dough is hardening, fill a small amount of apple compote in the middle, turn the apple slice up side down. Move the apple slices around from time to time, until they are round and golden. Served them warm together with icing sugar and your favourite jam. 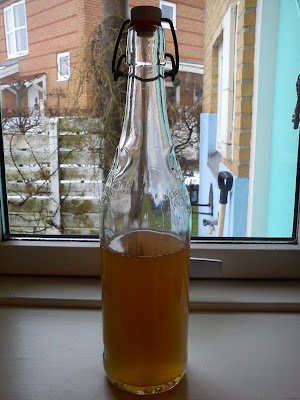 I found this suggestion on making kardemommelikør (cardamon liqueur) on the blog called "Klidmoster",as I have some kind of attraction towards cardamon as spice, I decided to make a bottle of cardamom liqueur for me self and my various Christmas guests. Start by adding boiling water to a glass bottle. Add sugar and water into a cooking pot together with the cardamon kernels, heat this sugar syrup up to the boiling point. Empty the glass bottle for water, and pour the sugar syrup with cardamon kernels into this bottles. Fill up the bottle with vodka. Shake everything together. Let the vodka extract the flavour for 10-14 days. Pour the cardamon liqueur through a sieve. 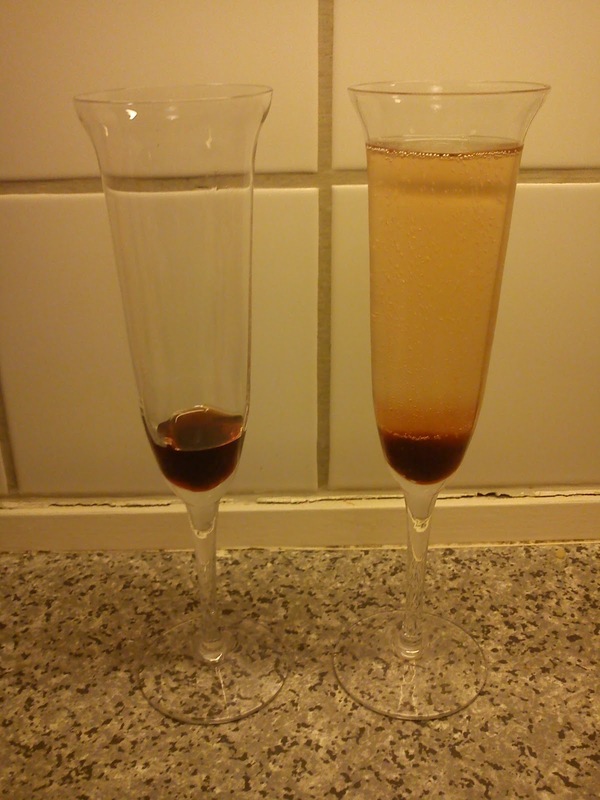 Fill the sieved cardamon liqueur into a new clean bottle, which is stored cold in the refrigerator . I have another "sweet tooth" for the Italian panforte. I always buy one of these cakes, when I have been in Italy. You can also buy them in Denmark, but here they cost a fortune, so when I found a recipe on panforte, I decided to test it out. 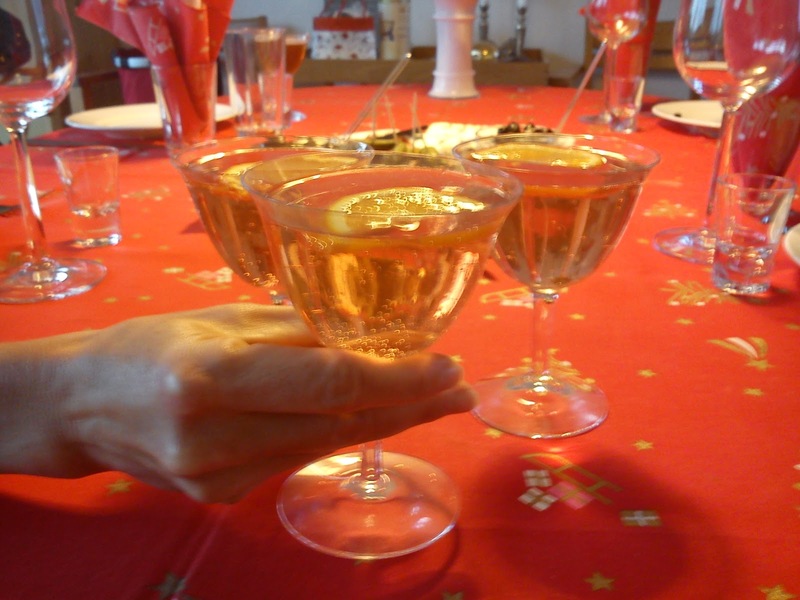 And it taste great, so therefore I am sharing this recipe with you in this Christmas Calendar. Heat the (conventional) oven to 175'C. Mix nuts, marzipan, orange peel, sucat into a mixing bowl. Add flour and the various spices into the bowl, mixing well. 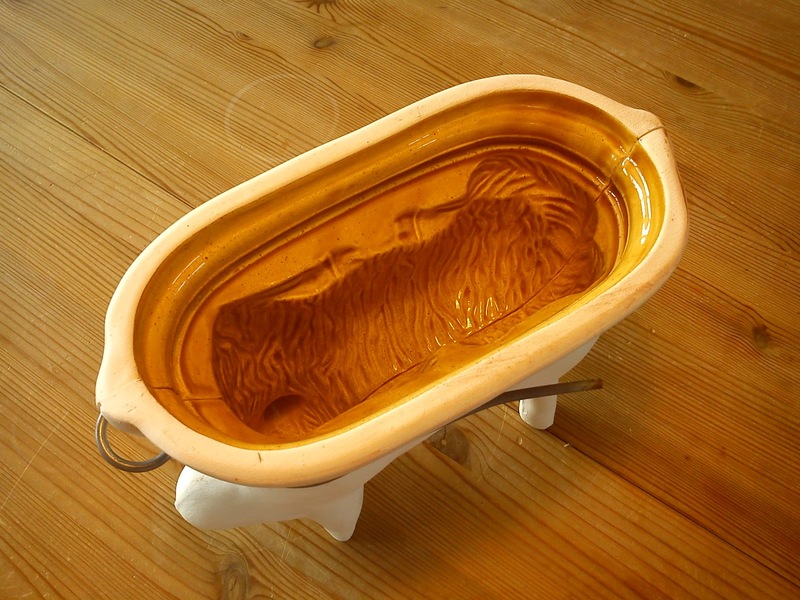 Add honey and sugar into a cooking pot, let it melt it together and cook it up to the boiling point. Pour the honey-sugar mass into the mixing bowl. Stir everything together. Cover a cake form with baking paper. Press the cake mass into the cake form. Smooth the surface of the cake with a spoon, which has been dipped into water. The dough should not have a height over 1 cm. Bake the cake in the oven at 175'C for 35 minutes. Remove the baking paper from the cake and cover the surface with icing sugar. Christmas Calendar 2012 Day 15 - "Croissant à la vanille"
Let´s continue with baking some more cookies for Christmas. 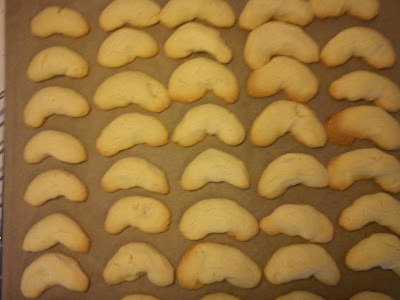 Today I am going to share a recipe from a good France colleague, this is her favourite cookie back from childhood. After I have baked these cookie, I was able to share them with her. This is always a scary situation to share you version of another person´s favourite with this person. Is it living up to this person exceptation or not. In this case we both survived this "test baking" of mine. And all other people, who afterwards have eaten these croissant cookies likes them a lot. 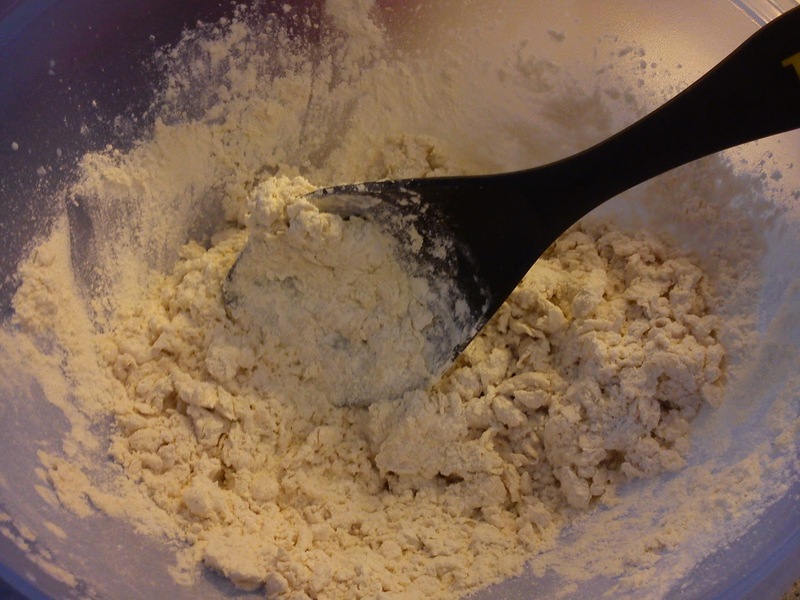 Sieve the flour and baking powder together into a mixing bowl. 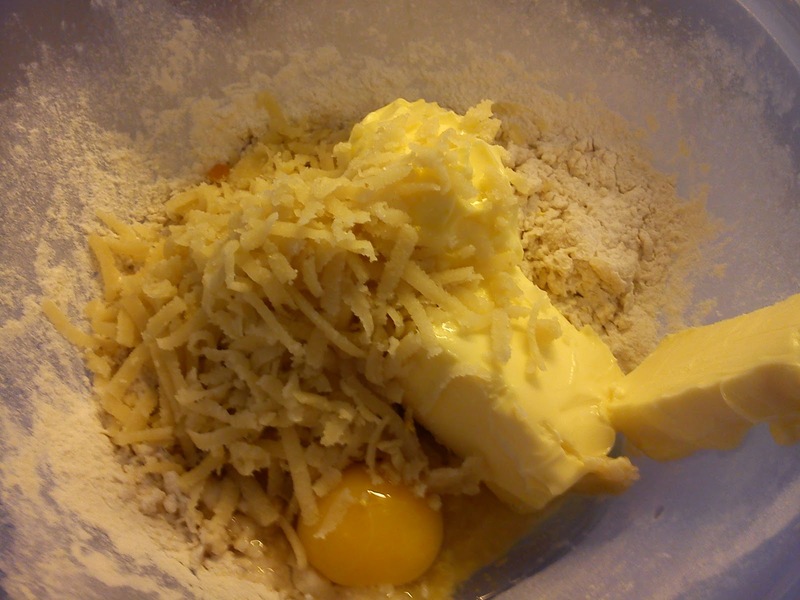 Add sugar, vanilla sugar, salt and egg yolk into the mixing bowl. Knead the cookie dough together, until it is smooth. 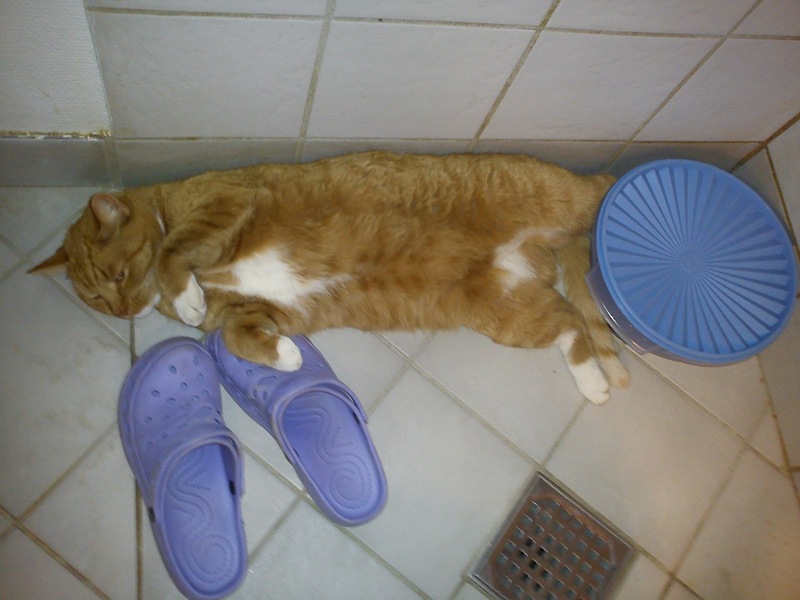 Leave to rest in the refrigerator for 1 hour. Heat up the (conventional oven) to 175'C. 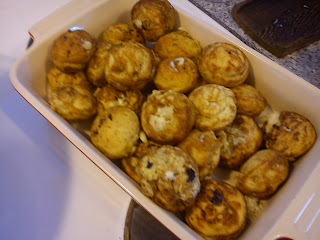 Divide the dough into ball with the size of walnuts. 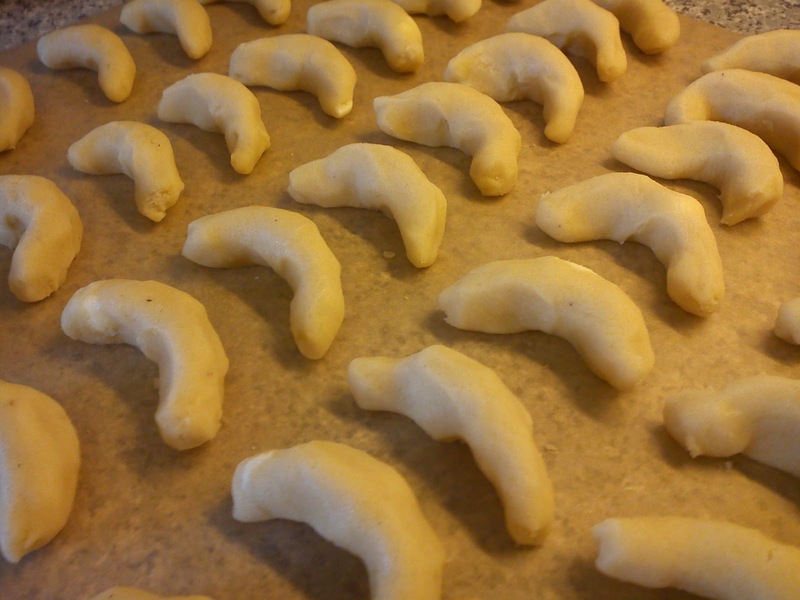 Roll them in small cylinder shape and tighten the end to form a "croissant" shape. 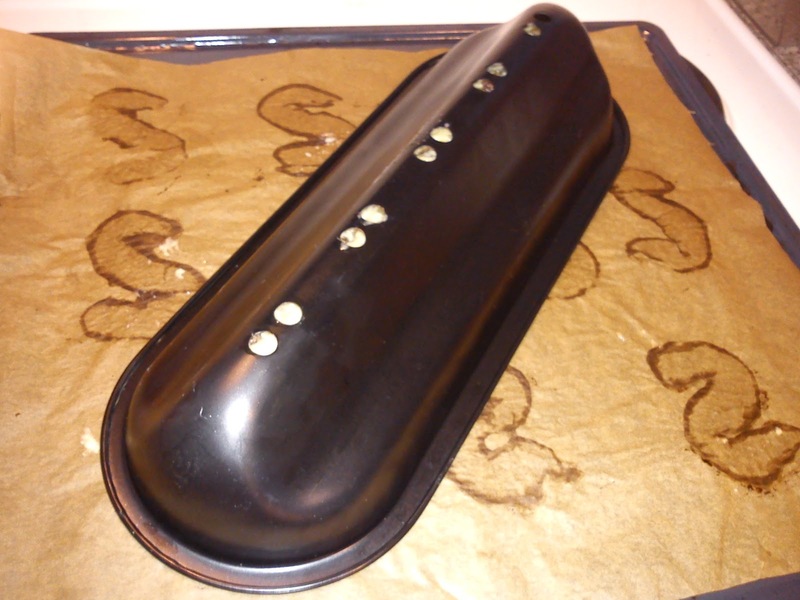 Cover a baking tray with baking paper. 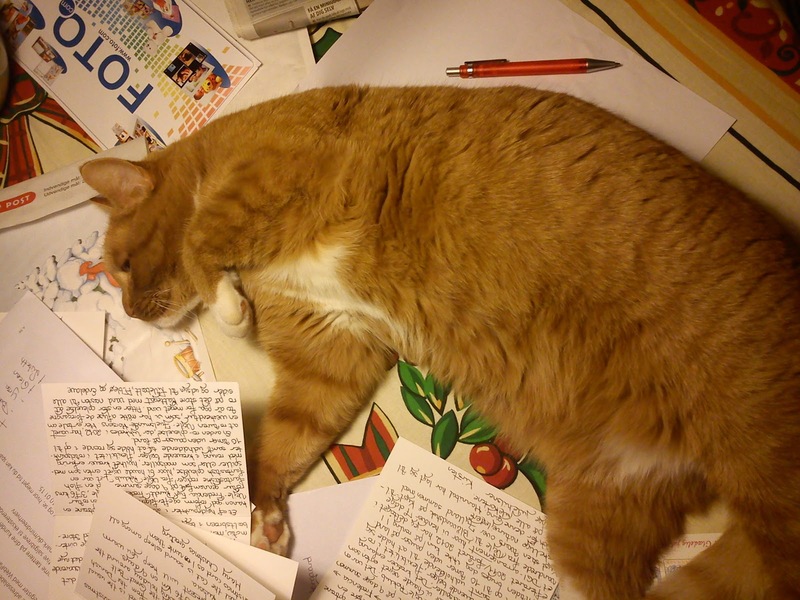 Place the "croissant" on the baking paper. Bake them in the upper part of the oven at 175'C for 15 minutes. 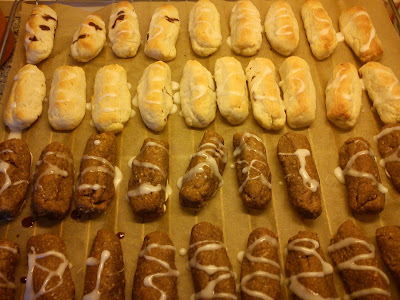 Leave the cookies to cool down, before they are sprinkled with a mix of icing and vanilla sugar. 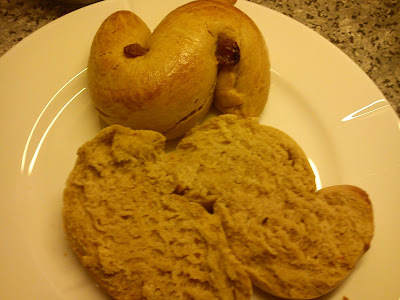 In Denmark we do not have specific food, which we will eat in order to celebrate the Lucia Day, but this they have in Sweden, where I have locate this recipe on Lucia buns / lussekatter on a Swedish blog called Anne´s Food. So I have bake these Lucia buns following her recipe. And when I saw, that these buns contained saffron, I knew, that I needed to make them, as I have an addiction to saffron. These buns taste fantastic with this combination of butter and saffron.